Jennings nets a nice crappie for Kalonka during last Saturday’s TV show. 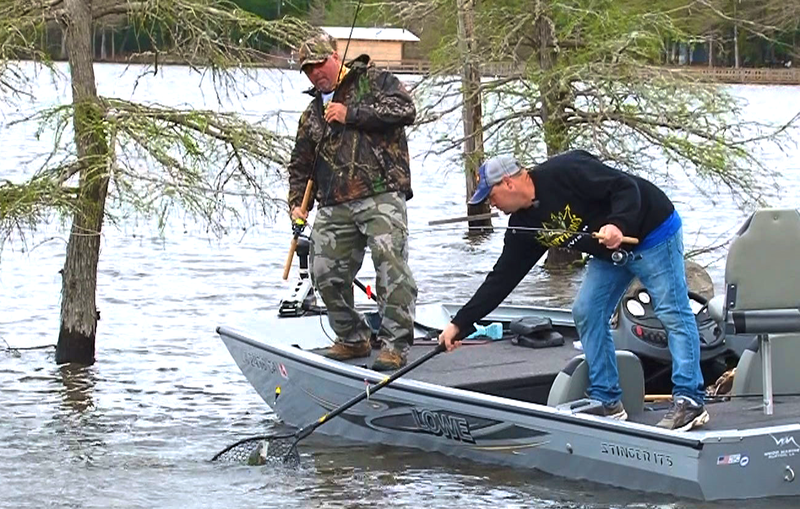 Saturday’s third television report about Lake D’Arbonne and the surrounding area on Krappie Kings TV was just as entertaining as the first, and it was fun to watch show host Karl Kalonka and his local fishing partner, Brandon Jennings, catching D’Arbonne’s big crappie shallow. The majority of fishermen on D’Arbonne seem to like the deep bite, finding schools of fish in the channels fishing 15-20 feet deep. For me, I prefer the shallow bite, just because I like flipping a little jig or spinner around a grass bed, around trees or just in favorite areas around the bank and flats where crappie like to spawn. You catch a variety of fish — the big males guarding the nests and the even bigger females cruising the shallows to lay their eggs. It won’t be long until it’s time to do that, and I’m hoping to get to get in on the shallow bite a bit myself! But it won’t be the next couple of days. Go away Winter.